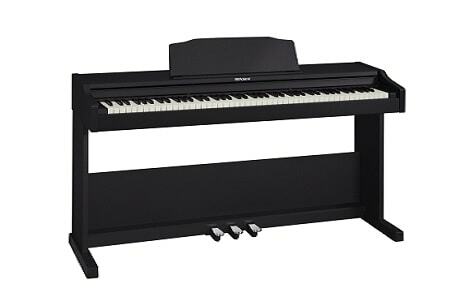 The Roland RP102 sets a new standard for affordable beginner pianos, combining a high-quality sound and feel, with inbuilt Bluetooth that gives access to powerful learning and performance tools. The RP102 has a fully weighted key action. Unlike other pianos in the same class, each key is individually weighted, giving a highly responsive touch to the player. The combination of this key action with the vast tonal range of the sound engine, results in an incredibly expressive piano and a perfect introduction to piano playing. The included headphone input allows for silent practice at any time of the day, with the same level of quality expected through the speakers. The RP102 is in a simple, yet elegant piano cabinet that incorporates a classic three pedal configurations, essential when progressing as a player. The foot pedals can also be used for hands-free turning of onscreen music pages, when using apps such as PiaScore and Sheet Music Direct, all controlled via the inbuilt Bluetooth. When used in conjunction with a tablet or smartphone, the inbuilt Bluetooth gives access to some incredible learning tools. The free Roland Piano Partner 2 app (available on Apple and Android devices) shows musical scores of the inbuilt songs and scales within the piano, which can be slowed down to learn at your own pace. Other great features of this app, include an inbuilt recorder that can score your music, a piano diary to track progression and a fully adjustable metronome, as well as many other features.